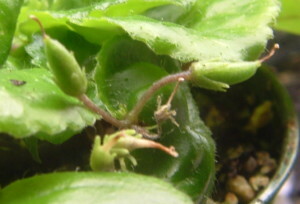 The flowers of African Violets are on peduncles that arise from the crown or from the leaf-axils along the creeping stem. 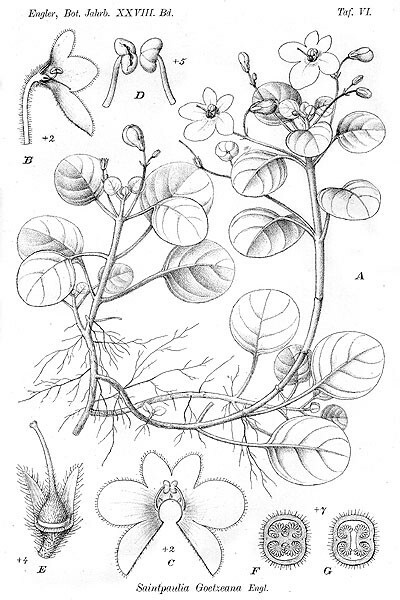 The peduncles bear 2-10 or more flowers in a cyme. The sepals, pedicels, and peduncles are usually covered with glandular hairs. The flowers are blue, blue-violet, bicolored or rarely white. The flowers are zygomorphic and 2-lipped with 5 rounded lobes. The upper lip is 2-lobed and smaller than the 3-lobed lower lip. The two anthers are conspicuously bright yellow and are united at their tips. The pollen is not shed spontaneously. Sterile stamens or staminodes are represented by 2-3 papillae on the floral tube. A ring-like orange or yellow disk surrounds the base of the superior ovary, but does not secrete nectar. The style and the stigma usually have the same color as the petals. The ovary is exserted slightly to the left or right of the center of the corolla. The stigma is 2-lobed, small, papillose and often has a central depression. Fruits are a loculicidal capsule and vary in shape from cylindric to ovoid. The fruits remain green for several months and are tardily dehiscent when dry and mature. 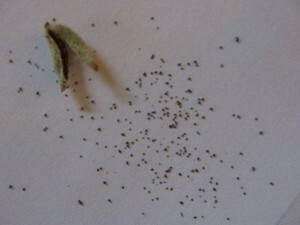 Seeds are very small, numerous, ranging from 20-300+ per fruit. Viable seeds are dark-brown to black in color and often have ridges on the seed coat.